The Hawaiian Hazelnut flavored coffee features a thick flavoring of coconuts and hazelnuts merging together to create a hearty island treat. If you like the fruitiness of coconuts and the buttery thickness of hazelnuts, this blend of flavors will take care of your island dreams with its 100% Arabica beans and wholesome flavors. Sealed and shipped in a heat-sealed valve bag, this decadent flavored coffee will be roasted and shipped on the same day. 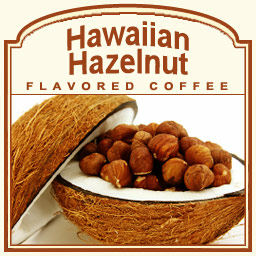 Let the aroma and deep flavor of the Hawaiian Hazelnut flavored coffee wash over you with its richness of bold blended flavors!